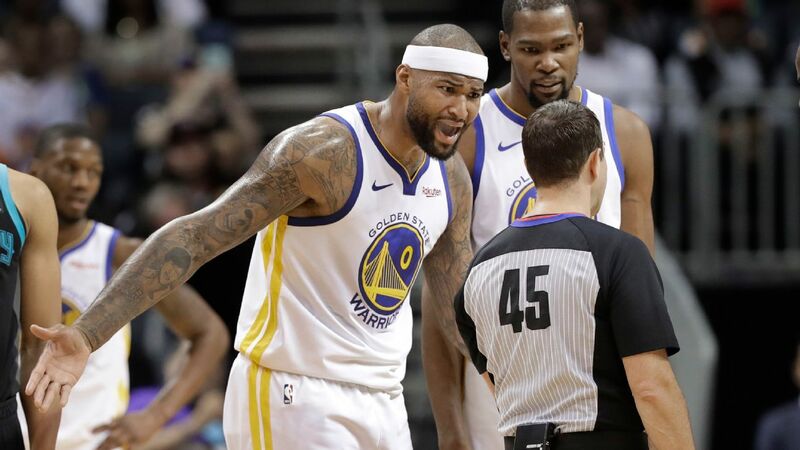 CHARLOTTE, N.C. -- Golden State Warriors center DeMarcus Cousins played his best game of the season in a 121-110 win over the Charlotte Hornets on Monday night, but it was a technical foul he received in the fourth quarter for tossing a shoe off the court that left him frustrated following the win. The play in question came with 4 minutes, 51 seconds left in the fourth quarter when Hornets guard Jeremy Lamb's shoe came off near the free throw line. Cousins, who was defending in the area, picked the shoe up with his right hand and tossed it to the sideline. He was whistled for a technical foul by official Brian Forte right after the shoe flew out of bounds. Cousins, who missed almost a year of play after tearing his left Achilles last season, could not believe the call and went over to Forte a couple times to plead his case. "Next time I'll just step on the shoe and roll my ankle, break it, tear an Achilles," Cousins said after the game. "Just leave it out there next time. I guess that's what they want. I'll keep that in mind." Cousins said the expiation he got was simple: "Basically, you can't throw a shoe." 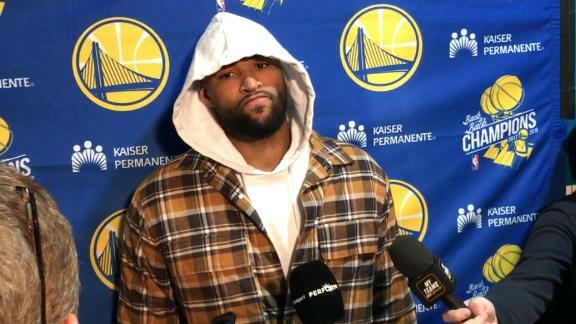 Cousins' teammates were also surprised the call was made, but Warriors forward Draymond Green made it a point to say he thought Forte officiated a solid game. "I don't know if I've ever seen that," Green said. "But that's crazy. It's sitting in the middle of the floor. I don't know. We have all these rules for player safety. You can barely contest a shot without getting a foul, but you're supposed to leave a shoe sitting there. It's just kind of crazy to me, but it is what it is. I thought Brian Forte reffed a great game tonight, so that's one call that's a little questionable. But he was spot on with some calls, so I thought he reffed a great game." Warriors head coach Steve Kerr also said he hadn't seen the rule enforced, acknowledging that it must be the letter of the law now. "I don't know what the rule is," Kerr said. "I don't know if there's an automatic rule that if you toss another guy's shoe out of the bounds -- on the other hand it's right in the way, somebody could get injured. So I wasn't really aware of what the rule was. He got the technical, so I guess that's the rule." Warriors guard Stephen Curry said he had seen the rule enforced "plenty of times," playfully noting that Cousins just needs to toss it slower next time. "He's got to be a little bit more delicate throwing it to the sideline -- like horseshoes," Curry said, "Just got to touch the line and sit down, not throw it in the stands. He's too strong, that's all. Too strong." The good news for Cousins and the Warriors is that after struggling to find a rhythm the past couple of weeks, he had his best performance since returning to the lineup on Jan. 18, finishing the night with 24 points, 11 rebounds, three assists and three blocks. "This was the happiest he's looked," Kerr said. "He looked the most comfortable tonight. And he made a couple moves around the hoop where he showed great agility -- this is the best he's looked." Cousins has been getting encouragement from many of his teammates for weeks now, but he singled out Kevin Durant and assistant coach Jarron Collins for their recent pep talks. "K's been preaching to me; can't say preaching. K's been cussing me out, just about stop thinking about it, just go play my game. J.C.'s also been on my head about just going out and being aggressive, picking my spots to be aggressive in the open floor. And I found some spots and made some plays, so it was good to get a good one under my belt." The biggest positive number for Cousins and the Warriors was that he played a season-high 31 minutes after being capped at about 25 minutes prior to the All-Star break. "I think he's been hoping to up his minutes. He's told me that," Kerr said. "I'm well aware of that. And he played really well tonight." Cousins admitted the 31-minute mark was the highlight of his night. "I'm more happy about that than the actual game," Cousins said. "I made sure to give Steve a big hug after this." DeMarcus Cousins receives a technical foul after throwing Jeremy Lamb's loose shoe into the stands to avoid stumbling over it. 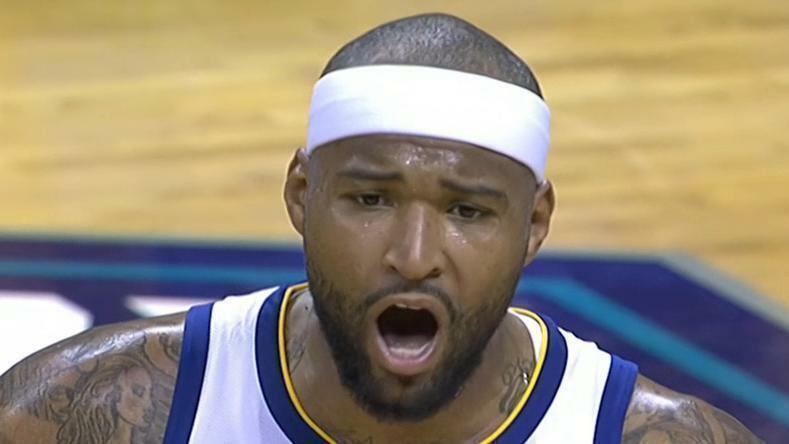 DeMarcus Cousins says that next time he'll step on a shoe on the court and tear his Achilles.